Way past bedtime on 17th December 2005, frazzled European leaders decided how to spend just under one trillion Euro. They set the EU's budget framework from 2007 to 2013 - and committed €947 billion or just over 1% of EU GDP over the period. 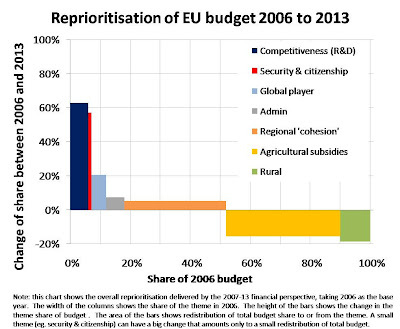 The chart shows the breakdown of the 2007 budget by major theme - dominated as ever by agricultural subsidies and 'regional' policy or what is now known as 'cohesion' policy (spending in poorer regions of the EU, supposedly to bring them closer to the EU average). The full budget from 2007-13 is in this spreadsheet [XLS] [source data]. You can also look at the 2007 Budget at a glance or expenditure by programme to see how the Commission describes it, and at an even more detailed material in the EU Official Journal if you want to risk insanity and blindness. Probably the best guide to how the budget is intended to be used is still the Commission's 2004 proposal, Building our common future. Review of the budget. During that endless December night, the leaders also agreed to have a thorough review of the budget, in plenty of time before the grim physics of bureaucratic inertia and the momentum of the status quo settle the budget for 2014-20, once again with only modest tinkering. The resulting 2008-9 Budget Review is now under way and we are invited to respond to a short consultation paper by April 2008 and participate in a discussion forum [see my comment]. The Commission has declared there should be 'no taboos'. My overall view is that very little of what is currently spent through the EU budget can be justified. But there is one big strategic change to make: shifting from inward-looking and unjustifiable spending within the EU to outward-looking strategic spending as the EU plays a bigger role globally. This is the big challenge for the review. I thought it might be an idea to set out some facts and arguments to back this point of view and address the question: what should be done with the EU budget? Let's start by looking at what has been done so far. The chart to the left shows how the new 7-year framework will shift priorities within the near €1 trillion 7-year budget - based on how the share of this budget allocated to each theme changes over the 7 years. There is a reduction in the share taken by agricultural subsidies and rural policy and a sharp increase in spending on 'competitiveness', which includes R&D, energy & transport, skills and innovation. This is supposed to support the Lisbon Strategy [EU description], which aims to make the EU the top knowledge-based economy in the world, though there is little hope of that. Disappointingly there is only a small increase in the funding for the EU's role as global player - and from a small base. The total reprioritisation (budget share shifted between themes) is just 8% over the seven years. I think that reflects the way the budget is settled at the last minute in a bureaucracy - incrementalism rather than a first principles approach is always likely to prevail. This is an improvement - but not enough of an improvement over seven years, and the focus on 'competitiveness' through government funded R&D is misplaced - as we will discuss later. 1. 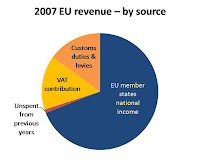 The EU doesn't really have any money of its own - most of its money comes from contributions by member states, plus some from VAT and some from import tariffs (see chart to the left). When money is spent by the EU, it isn't 'additional', it is money no longer available to spend by member states. Obvious, but it means the question is not whether money should be spent, but at what level. 2. Accountability is poor: when money is spent at EU level, the link between the original taxpayer / voter and the body through which the spending is done is weak and diffuse. To a citizen in a member state, money coming from the EU looks additional - like a grant of extra money. There is a danger that member states will seek EU funds where they wouldn't spend the money themselves - for example in subsidising rich land-owners. 3. The EU is prone to a 'juste retour' (fair return) approach to spending... you get out what you put in (this is especially true in R&D). Add to this the tendency for member states to fight hard to get the budget spent in their country no matter how compelling the case for it to be spent elsewhere. A layer of messy and inefficient 'political economy', or 'pork-barrelling' must be factored in. Some say that this dynamic means the member states are less likely to tackle fraud in EU spending as the money is coming from somewhere else. These 'principal-agent' problems are intrinsic to the relationship between the EU and its member states. They are a reason to be cautious about pushing money through the EU budget unless there is a really strong case for it. What are the things for which can we justify spending from an EU budget? There are three dimensions to this: (1) should government or the public sector be involved at all? (2) is spending the right way to meet the objectives compared to other interventions? If there is a case for public spending, (3) is the European Union the right administrative level to do the spending, compared to say national or local government? 1. Public versus private? Should government be involved at all? I think a reasonable rationale for government intervention is that used by the British government: government intervenes to address market failures (eg. externalities, public goods, information asymmetries, collective action failures etc) and to meet equity or distributional objectives (eg. 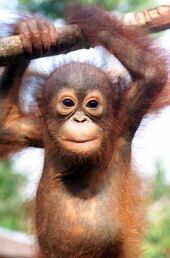 through providing universal schooling, health care). These ideas are discussed in the UK Treasury's Green Book section on rationale for government action. 2. Spending versus other instruments? The EU has several instruments available to promote its objectives: regulation, economic instruments, development loans, standard-setting, policy co-ordination (eg. the state aids regime) and softer options like establishing good practice or developing comparative indicators. 3. Spending through the EU versus spending through member states or more locally? The guiding principles of the EU are that responsibility ('competence') should at the lowest administrative level, and only at EU level if there is no alternative or the benefits are substantially worthwhile and if the EU member states agree. The formal principles that codify this into the treaties are: subsidiarity; proportionality and conferral. A word about politics... This is perhaps an ideal 'analytical' framework for considering what should and shouldn't be spent through the EU budget. But the EU is a political settlement and political bargains, including spending commitments, will hold it together. So while I think we should strive to apply the criteria above, we should expect it to deviate where politics dictates otherwise. But political determination of the budget is likely to be a cause of waste or inefficiency and, given the poor accountability of EU spending, a reason to keep the budget down. Where might EU budget spending be justified? 1. Funding genuinely Europe-scale activities or the provision of non-market goods at EU scale - but there are surprisingly few of these. Perhaps border security, policing and anti-terrorism; some research or science projects (space, particle physics, transboundary pollution monitoring and research etc). There are very few nature reserves that could be considered 'pan-European' (perhaps Slovenia?). But by far the most important pan-European activity will be when the EU acts collectively as a global player - for example promoting a response to climate change in developing countries; responding to humanitarian crises; intervening in conflicts or genocide or acting on the 'responsibility to protect'; contributing to meeting the millennium development goals. 2. Transfers between from rich states to help poorer states improve welfare? This is the 'cohesion' theme in the budget. However, for every case for a transfer within the EU, I think there is always a more compelling case to transfer from the relatively affluent EU to much poorer developing countries or to countries on the periphery of the EU where the EU has wants peace and stability and future accession states. The members of the EU and potential accession states are middle income countries. I would expect their development to be funded through hard loans from development banks, rather than grants. The EU has the European Investment Bank for exactly this purpose. 3. Where member states wish to co-ordinate their spending or act in concert. The most charitable view of this is that member states wish to establish norms throughout Europe that go beyond what they would each be prepared to do unilaterally. The less charitable view is that member states like to hide difficult decisions or unpopular spending within the EU's opacity, and take advantage of its democratic deficit. In either case, I think the better approach is to agree standards or outcomes, or define common policies, and do the spending locally - so that it can be managed with local accountability and scrutiny. 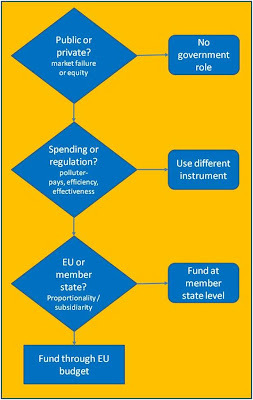 Almost all environmental spending works this way - EU directive impose high compliance costs on members states and their industries and consumers. 4. Legacy and transition. The EU is not starting with a blank canvass - it intervenes heavily in agriculture markets and agricultural production systems and livelihoods are configured around this massive intervention. It should stop intervening, but not overnight. Other areas, such a regional 'cohesion' funding could be unwound more rapidly, but they may be part of the political deal underpinning enlargement and we will have to taper these expenditures more rapidly. What does this mean for particular budget lines...? The case for providing grants for infrastructure or social spending for poor areas within the EU, especially through an EU mechanism, is very weak. If the investment creates economic growth (as the Commission argues it does in its 'Fourth Cohesion Report') then the investments should be paid for from the proceeds of growth - this is how development finance works! If it doesn't create growth, then why have it? All the member states are at least middle income countries and would not qualify for grant finance from international financial institutions. For example, grant finance is available to the 80 poorest countries in the world through International Development Association of the World Bank, but everyone else develops through loans The European Investment Bank exists for this purpose in the EU and all EU member states can access the capital markets - and that is what they should do. There may be a case for public spending in poor areas of the EU - but I think think this should be a matter settled at the member state level. In other words, governments should take direct responsibility for the extent of redistribution and inequality within their countries. If the EU has grant funding available for 'cohesion', in every case it would be better used outside the EU with poorer countries or where Europe has important political objectives. Verdict: renationalise regional 'cohesion' policy, use loans rather than grants for development within the EU and create a 'global cohesion fund' for grant spending outside the EU (or add to existing development instruments). There is no real justification for these and they should be wound down at the fastest rate that does not cause serious dislocation - that would streamline EU farming, land policy and help us in trade talks. 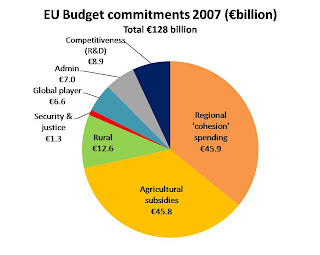 The EU still subsidises to the tune of one third of gross farm receipts, and about half of that comes through budget payments (OECD). A worthwhile aim would be to have direct payments through the EU (effectively subsidies to land) reduced to zero by the end of the next financial perspective in 2020. I don't have any evidence that this is the optimum speed of taper, but I think a seven year adjustment, signalled three years before it starts, is a long time for an activity that isn't highly capital intensive. There may be a case to allow member states to subsidise particular types of agriculture for social or cultural reasons: the EU role could be to set maximum allowable level of subsidies and to ensure these are minimally trade distorting (ie. the EU would be a co-ordinator of allowable state-aids, which would be welfare payments to farmers engaged in particular activities deemed culturally important). If France wanted to fund its foie gras sector, fine by me - as long as its the French taxpayer and French politicians that are accountable. I can always go there on holiday or purchase it from La Fromagerie. ...solid argument for decentralising to Member States the distributive function of the Common Agricultural Policy, as is already the case for all other individual distributive policies. Verdict: abolish direct farm subsidies by tapering out by 2020 and in the interim have more of the cost of subsidising farmers carried at national rather than EU level, especially if it is going to take longer than 2020. Create some flexibilities for member states to subsidise particular groups for cultural reasons, but at national not EU level and subject to state aids rules. A lot of this is just more imaginative (and to be fair, more worthwhile) schemes for funding farmers. But hardly any of it can be justified at EU level. There is something annoying about the UK reports to the Commission on the England Rural Development Programme and now the Rural Development Programme for England - the prime vehicles for spending EU rural money. This is money paid by the UK taxpayer, sent to Brussels, then returned to the UK with strings and reporting requirements. What is needed here is more careful assessment of the case for European action. Pillar 1 to pillar 2...? We should be wary of the expedient arguments of the environmental lobby which has a "convert Pillar 1 to Pillar 2" approach. Pillar 1 is the vast majority of spending - pure wasteful subsidy. Pillar 2 is payments for rural development and environment. But I think much of Pillar 2, whilst important, fails the subsidiarity test, and should be funded at national level - with the EU setting standards and imposing fines for non-compliance where a co-ordinated approach is needed. This is the dominant model for EU environmental policy - co-ordination, regulation and enforcement, not spending. There may be some true European public goods - things we all value that would be under-protected if left to member states, or areas where there is a particularly high demand (eg. Slovenia has a very high proportion of its land area designated for nature protection). We should also note that payment from the EU rather than from national budgets creates an incentive to engage in nature protection, for example by designating conservation sites, simply to claw back money from the EU. I'm nervous about this motivation because of what it means for democracy and accountability. Perhaps it would be better if there were some way of civil society groups or other independent bodies determining what ecology should have conservation status. Verdict: renationalise most of EU rural policy, except where pan-European legitimacy can be justified. Continue to base EU environmental policy on co-ordinated standard setting with member states responsible for ensuring compliance and spending as appropriate. This theme has seen the largest increase and reflects the EU's focus on what it calls 'competitiveness' - or the Lisbon strategy. The spending is spread over several headings (Education and training, Research, Innovation, Energy and transport networks, and Social policy). 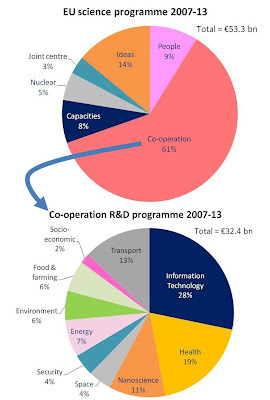 The lion's share is funding for the 7th Framework Programme for Research and Technological Development and you can view the budget allocation summary here (see chart) This is the EU's main R&D spending and includes initiatives to support research, institutions and scientific careers. A beefing up of R&D spend is surely a good thing, isn't it? Well, there are many arguments over this... first, I don't think R&D spend (an input) translates easily to innovation, which is more about culture. Nor do I think competitiveness derives much from R&D, which is more about skills, labour market flexibility, competitive pressure etc. In the services economy, traditional R&D counts for little. If one accepts that science does a have an important role, do we think the EU is the right place to organise science spending? If it is about 'competitiveness' and much competition is within Europe, how would the EU justify supporting one company not another? How does publicly funded intellectual property become exclusively owned by a company that can then use it to compete? And what about the EU co-operative research model...? Researchers and their institutions are ferociously competitive to publish papers, secure patents and win Nobel prizes. Does Europe force its universities into unproductive bureaucratic collaborations just to get their hands on the money? In theory, widening the number of institutions and researchers that can bid for a pot of money should ensure that allocation goes to the best of a larger bunch - and so is spent better overall. That sounds okay, but a meritocracy in spending would tend to drive money towards Northern Europe's big players - UK, Germany, France and the Scandinavians - and their 'Ivy league' institutions. Essentially redistributing from poorer to richer. Hmmm... that doesn't sound right. Alternatively, the money could be spent on a 'juste retour' basis (each getting back what they put in), but that loses the main advantage of pooling money. European or global coverage: eg. acid rain monitoring, studies about the EU, standard setting to inform EU legislation. Public purpose: avoiding too much wheel re-invention through EU level co-ordination where the research doesn't necessarily lead to a product or is aimed at producing 'public goods' - security, some health research, major climate change technologies (carbon capture and storage). In addition, I think there is scope to strengthen institutions and provide open support for talented scientists or researchers - these are good ideas in the 'ideas' 'people' and 'capabilities' components of the framework programme. It's hard to see why there should be EU spending on information technology, nano-technology, biotechnology, or any technologies that can be commercialised. Verdict: don't accept the that the EU's R&D spend has much to do with 'competitiveness' or the Lisbon strategy. However, there are legitimate reasons to organise some funding at the EU level where scale, coverage or co-ordination in developing public goods justifies EU action. Support for people and institutions will also strengthen Europe's overall system for innovation. "Freedom, security, justice and European citizenship" to give the full title, does a number of worthwhile things and doesn't cost much - managing migration, preparing accession states, some security, public health etc. But there are some areas where you would want to know something worthwhile was being achieved - for example 'media', and 'culture & diversity'. One fears that these might be budgets that support 'make-work' activity needed to justify having 27 Commissioners. Verdict: scrutinise expenditure for value for money and check for overlap with other institutions. Common foreign and security policy (CFSP) and its security dimension, the European Security and Defence Policy (ESDP). This function of the EU is potentially extremely important in the future, though currently still heavily constrained by political nervousness. The role could including acting on the UN's 'responsibility to protect' principle and the UN genocide convention. The EU is beginning to intervene collectively - in Bosnia (through EUFOR), policing in Afghanistan and missions to Southern Lebanon and DR Congo [more]. Humanitarian assistance for emergencies (earthquakes) or crises (Darfur, DRC) combined with standing response capacity. The EU spends about €600m annually through ECHO - the DG for Humanitarian Aid [more]. Promoting stability on the EU's periphery - North Africa, Middle East, Eastern Europe and Central Asian Republics - for example, by investing in institutions, environmental protection, support for democracy, and creating an acquis-lite to establish associate member status with access to the single market. The EU has the European Neighbourhood Policy, which aims to strengthen links with Algeria, Armenia, Azerbaijan, Belarus, Egypt, Georgia, Israel, Jordan, Lebanon, Libya, Moldova, Morocco, the Palestinian Authority, Syria, Tunisia and Ukraine. Relations with Russia are managed through an increasingly fraught 'Strategic partnership'. Promoting a European model of democracy and human rights. The EU could do far more to champion the cause of human rights and a broader definition of democracy (ie. broader than the American view). The EU's external relations portfolio has strong rhetoric on human rights and it could become a major global role for the EU [see activities here]. The key funding stream is the European Initiative for Democracy and Human Rights [EIDHR] and this will spend €1.1 billion 2007-13. The point is that these are all excellent things for the EU to be doing on behalf of the 27 member states. In none of these areas could anyone claim that the potential to do good has been exhausted. So I see this as an area where very substantial additional funding could and should be absorbed - though an increase should be phased at a rate that allows the administrative and political capacity to develop proportionately. Verdict: this is where the EU should be doing much more, and where more of the budget should be spent. The critical requirement is a strong political mandate. Like all bureaucracies the EU is guarded and apologetic about the amount it spends running itself. It shouldn't be. Nor should it be measured by what proportion of the budget it takes, with the presumption that the smaller proportion the better. The key understanding is that the European Commission and other institutions are not there to spend a budget but to administer the European Union jurisdiction - proposing directives, supervising the single market, negotiating at WTO meetings (ie. important things that have little to do with the budget). With a strong dose of subsidiarity, the EU budget could be cut by two-thirds. But the administration costs would fall by nothing like so much, and the percentage of the budget devoted to 'administration' would rise sharply. But that would be a good thing. It's a slightly cheap comparison, but it is worth bearing in mind the EU has about 30,000 civil servants, compared to about 540,000 in the UK [stats]. I'm not for one moment suggesting that the EU institutions are free of waste and incompetence. Goodness no. Just arguing that lower administration spending is not a sensible objective in its own right. Verdict: a well functioning administration has great leverage on the effective of the spend of the whole budget and the entire EU programme - improving allocative efficiency. Spend generously on administrative resources, but push hard for improved managerial efficiency - avoid waste, avoid over-paying, have a good performance framework, move the under-achievers out. Overall verdict: apply rigorous tests for rationale for government intervention, spending rather than other instruments and spending at the EU level. On that basis phase out agricultural subsidies and 'cohesion money', remain sceptical and discerning about spend on R&D but be far more bullish about funding the role of the EU as a global player. Tony Blair made a powerful case for reform in his speech to the European Parliament in June 2005, but by then it was to late to deliver meaningful reform through the European Council. The Budget Review was a commitment to have another go, but with enough time to create strategic reform for the next financial perspective. I hope the UK government still sees it that way. There's more to be said about where the EU raises it's revenue and the UK 'rebate' - but this posting has already gone on too long! "Phase out agricultural subsidies". If only! Great post, though. Excellent analysis as always Clive. My concern about the budget review is that it has been limited to thinking about the policy options, with no real scope for considering the politics of how the budget is decided... And given that the EU's limited political energy is currently directed towards securing the ratification of the amending treaty there is a real risk that the review won't achieve the political purchase it deserves. Any further thoughts on how the politics of the review would need to change to make your agenda happen? I hadn't realised the spending on "cohesion" (redistribution) was so high. Excellent post. Thanks for putting this together. Chris - I think you are dead right to see the politics as both central and depressingly focussed on the treaty. Paradoxically, a powerful vision for Europe would help them get support for a new treaty, but they are too busy defending red lines, opt-outs and rebates to be bothered with all that. I think it requires real leadership, but also the more pedestrian skills of alliance building and awareness raising. That is about understanding better what the other other member states want or would be prepared to trade. I think it is also about creating a large change over a long period - perhaps two financial perspectives to phase out agriculture subsidies and regional transfers completely. I would like to think the Government has a cogent and powerful presentation of its case and is now taking that around the capitals of Europe. I would like to think that think tanks will have been mobilised to create an intellectual 'wall of sound' about the budget. I hope Mrs Fischer Boel has been told that if there are no taboos about the budget then there are no taboos about the CAP. I would like to believe that the obvious allies (Germany, Netherlands, Scandinavians etc) have been meeting at the behest of the British to find common ground. Perhaps there is a British 'non-paper' circulating amongst the Council and Permanent Representation staffs, floating a few ideas. maybe Gordon Brown or David Milliband will be setting out their vision for Europe, and its budget, in well-timed and well-placed speeches. Also, perhaps there are there mechanisms that could help make some of the changes painlessly - for example linking regional spending to GDP per capita so that they disappear through economic growth. Our finest minds could be designing subtle transitional mechanisms that offer subsidies today in return for phase out tomorrow. Who knows - it may all be going on without me knowing. It was all left far too late when it came to settling the budget back in 2005. On agricultural subsidies don't forget that New Zealand and Australia have gone a long way to complete phase out and did it quite rapidly. Worth remembering that only about half of farm subsidies come through the budget - the rest is 'market price support'... rigging the EU market to create higher prices so that consumers pay more than world market prices and farmers benefit as a result. Thanks for the pointer to the Green Alliance report: Investing in our future: a European budget for climate security. Very good... Lots of E3G fingerprints on that one!